Heres your nature lesson for today. 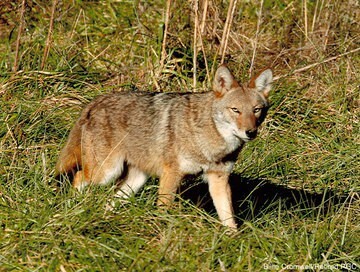 Throughout North America coyotes can live in backcountry and urban city environments. Until last night, I didnt know this. On my drive home from shopping in the city of Mooresville, I became befuddled as a strange dog-like creature ran out into the road, before me. Luckily, I didnt hit it (cheers to me for being a slow driver). As it skipped to the other side of the road I saw the strange creature wasnt a dog, and I suspected he was a coyote, having once seen one of these resilient creatures in the mountains. This brave creature sometimes referred to as a prairie wolf in the western part of the United States, quickly headed towards an empty bank parking lot. I turned my car around and drove into the banks parking lot, where I found the coyote sitting under a large streetlight. Startled, it looked towards my direction briefly before making a dash into a small patch of woods, which surrounded a heap of businesses and restaurants. I left after that, but the memory has not escaped me. "Where did the coyote come from?" "How does the coyote survive with the hustle and bustle of consumer culture booming around it?" "Is there a pack or is it like a lone wolf, fending for itself day by day in a world where it has been displaced from its natural habitat?"